This revolutionary new accessory features built-in MyQ® technology that connects to the Internet and allows you to monitor and operate your garage door opener, or turn on or off lights in or around your home, from anywhere in the world by using your smartphone or computer. It utilizes a two-way communication system that puts freedom and control in your hands. 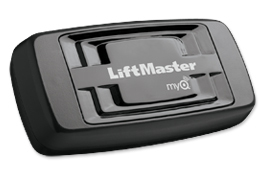 Compatible only with the following LiftMaster® products : LiftMaster® Security+2.0™ garage door openers with a yellow learn button (models 8500, 8550, 8557, 8587, 8355 and 8360), MyQ® Control Panel (model 888LM) and related MyQ® accessories (823LM, 825LM and 829LM).